Input: 15V 1A via 3.5mm plug. Output: USB1 = 5V 2.4A; USB2 = 5V 1.5A. 1 3.5mm plug IN port. 2 Regular USB OUT port. 1 Car Jump Starter OUT port. Ultimate charging kit can jumpstart a car as efficiently as charge a USB device. 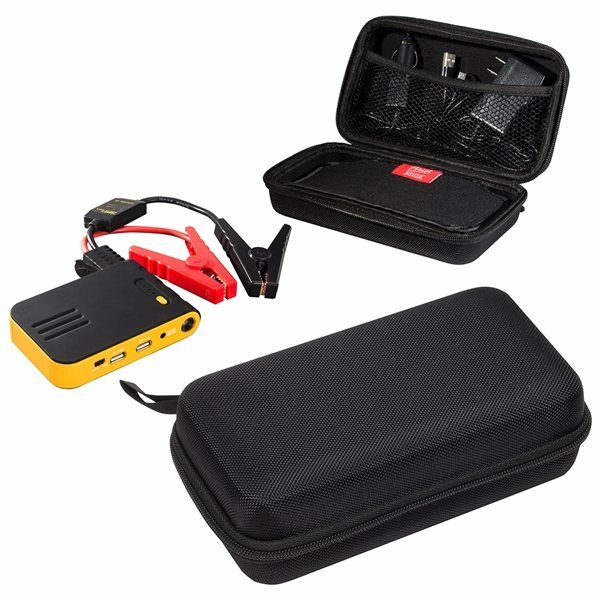 Includes smart car jumpstart cable, which is spark proof with short circuit protection, reverse polarity protection, and over/ under voltage production with sound notification. 8000mAh Li-Polymer ensures 1000 charging cycles and has the power to produce up to 20 jumpstarts on one charge. AC wall charger and 12V adapter included for convenient charging of power bank. Four LED lights indicate battery status and confirm charging function. 20" Micro to regular USB cable included for charging USB devices using the two USB output ports. Entire kit is packaged in a sturdy Nylon exterior case with a three-sided self mending zipper closure. Kit includes operation manual, including how to jumpstart a 12V battery. Excellent product, very professional looking and very well made. Individuals who received one felt special. the AnyPromo team was very patient and worked efficiently to get the exact detail I wanted. It's durable and made of quality material. Like the unique fashionable shape and style of the product. Alicia went above and beyond to get the perfect product for our sketch comedy group show...He was extremely helpful and pleasant. I am very satisfied with the quality and on time delivery of the products I ordered. It was a hit! Thank you!